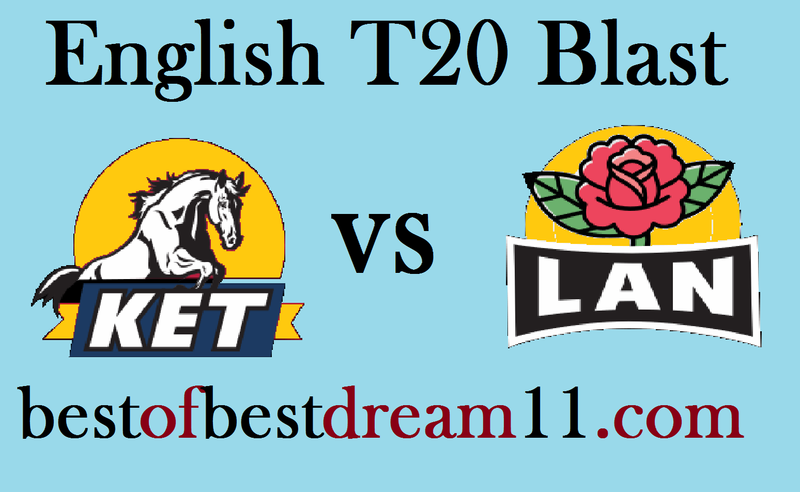 Here is best "KENT VS LANCASHIRE " 1st quarter-final match in Vitality T20 Blast 2018, Dream11 Predictions for the Fantasy user ,who venue are looking to make a strong team for maximum win. We are providing latest news, match update, information about the match .The team is picked by using various factors on the basis of performance, ground stats and latest form. After the end of all the league matches in the English T20 Blast, the first quarter final match will be played between the Kent and Lancashire. Kent finished second in the South Group poiny table with eight wins in 14 matches and will come into this match on the back to back 3 wins.On the other hand,Lancashire team finished third in the points table with 8 wins and 5 losses 1n 14 group ,atches of their North Group. It is quite a flat wicket, and batsman can get a lot of help on this.in this case,this match can be seen very high scoring. 1-For Kent, Sam Billings, Joe Denly, Heino Kuhn and Daniel Bell Drummond have all scored more than 300+ runs in this t20 Blast. 2-in bowling , Joe Denly and Adam Milne are the two best bowler for Kent. 3-Bell Drummond 80runs(51balls),Joe Denly 45runs and S Billings 33runs played good inning in the last match. 4-For Lancashire , Alex Davies performance has been fantastic in this tournament, he has scored more than 500 run so far. 👉 In Lancashire team,there is a comeback of both of their star players,Jos Buttler and K Jennings .